If you do not have space for a vegetable garden or if your present site is too small, consider raising fresh, nutritious, homegrown vegetables in containers. A windowsill, patio, balcony or doorstep can provide sufficient space for a productive container garden. Problems with soilborne diseases, nematodes or poor soil can also be overcome by switching to container gardening. Grow vegetables that take up little space – such as carrots, radishes, and lettuce – or crops that bear fruits over a period of time, such as tomatoes and peppers. 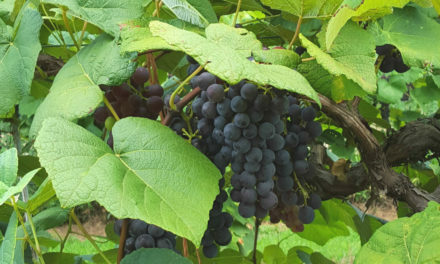 Dwarf or miniature varieties often mature and bear fruit early, but most do not produce as well overall as standard varieties. The amount of sunlight that your container garden spot receives may determine which crops can be grown. Generally, root crops and leaf crops can tolerate partial shade. 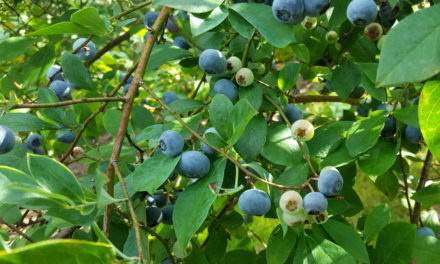 Vegetables grown for their fruits generally need at least five hours of full, direct sunlight each day, but perform better with eight to 10 hours. Available light can be increased somewhat by providing reflective materials around the plants, such as aluminum foil, white-painted surfaces or marble chips. Container gardening lends itself to attractive plantscaping. A dull patio area can be brightened by the addition of baskets of cascading tomatoes or a colorful herb mix. Planter boxes with trellises can be used to create a cool shady place on an apartment balcony. There are many possible containers for gardening. Clay, wood, plastic and metal are some of the suitable materials. Containers for vegetable plants must: (1) be big enough to support plants when they are fully grown, (2) hold soil without spilling, (3) have adequate drainage, and (4) never have held products that would be toxic to plants or people. Consider using barrels, flower pots, window boxes, baskets lined with plastic (with drainage holes punched in it), even pieces of drainage pipe or cinder block. If you are building a planting box out of wood, you can use rot-resistant redwood, cedar or cypress. Some gardeners have built vertical planters out of wood latticework lined with black plastic and filled with a lightweight medium, or out of welded wire shaped into cylinders lined with sphagnum moss and filled with soil mix. Depending on the size of your vertical planter, 2-inch diameter perforated plastic pipes may be needed inside to aid watering. Whatever type of container you use, be sure that there are holes in the bottom for drainage so that plant roots do not stand in water. Most plants need containers at least 6 to 8 inches deep for adequate rooting. The imaginative use of discarded items or construction of attractive patio planters is a very enjoyable aspect of container gardening. For ease of care, dollies or platforms with wheels or casters can be used to move the containers from place to place. This is especially useful for apartment or balcony gardening so that plants can be moved to get maximum use of available space and sunlight and to avoid destruction from particularly nasty weather. A fairly lightweight potting mix is needed for container vegetable gardening. Soil straight from the garden usually cannot be used in a container because it may be too heavy, unless your garden has sandy loam or sandy soil. Clay soil consists of extremely small (microscopic) particles. In a container, the undesirable qualities of clay are worse. It holds too much moisture when wet, resulting in too little air for the roots, and it pulls away from the sides of the pot when dry. Container medium needs to be porous because roots require both air and water. Packaged potting soil available at local garden centers is relatively lightweight and may make a good container medium. Soilless mixes such as a peat-lite mix are generally too light for container vegetable gardening, since they usually will not support plant roots sufficiently. If the container is also lightweight, a strong wind can blow plants over, resulting in major damage. Also, soilless mixes are sterile and contain few nutrients, so even though major fertilizers are added, no trace elements are available for good plant growth. Add potting soil if you wish to use a peat-based mix. For a large container garden the expense of prepackaged or soilless mixes may be quite high. Try mixing your own with one part peat moss, one part potting soil and one part clean coarse builder’s sand or perlite and a slow-release complete fertilizer. Lime may also be needed to bring the pH to around 6.5. In any case, a soil test is helpful in determining nutrient and pH needs, just as in a large garden. Plant container crops at the same time you would if you were planting a regular garden. Fill a clean container to within one-half inch of the top with the slightly damp soil mixture. Peat moss in the mix will absorb water and mix much more readily if soaked in water before putting the mix in the container. Sow the seeds or set transplants according to instructions on the seed package. Put a label with the name, variety and date of planting on or in each container. After planting, gently soak the soil with water, being careful not to wash out or displace seeds. Thin seedlings to obtain proper spacing when the plants have two or three leaves. If cages, stakes, or other supports are needed, provide them when the plants are very small to avoid later root damage. Pay particular attention to watering container plants. Because the volume of soil is relatively small, containers can dry out very quickly, especially on a concrete patio in full sun. Daily or even twice-daily watering may be necessary. Apply water until it runs out the drainage holes. On an upstairs balcony this may create problems with the neighbor downstairs, so make provisions for water drainage. Large trays filled with coarse marble chips work nicely. However, the soil should never be soggy or have water standing on top of it. When the weather is cool, container plants may be subject to root rots if maintained too wet. Clay pots and other porous containers allow additional evaporation from the sides of the pots and watering must be done more often. Small pots also tend to dry out more quickly than larger ones. If the soil appears to be getting excessively dry (plants wilting every day is one sign), group the containers together so that the foliage creates a canopy to help shade the soil and keep it cool. On a hot patio, you might consider putting containers on pallets or other structures that will allow air movement beneath the pots and prevent direct contact with the cement. Check containers at least once a day and twice on hot, dry or windy days. Feel the soil to determine whether or not it is damp. Mulching and windbreaks can help reduce water requirements for containers. If you are away a lot, consider an automatic drip emitter irrigation system. If you use a soil mix with fertilizer added, then your plants will have enough nutrients for eight to 10 weeks. If plants are grown longer than this, add a water-soluble fertilizer at the recommended rate. Repeat every two to three weeks. An occasional dose of fish emulsion or compost will add trace elements to the soil. Do not add more than the recommended rate of any fertilizer, since this may cause fertilizer burn and kill the plants. Container plants do not have the buffer of large volumes of soil and humus to protect them from overfertilizing or over-liming. Just because a little is good for the plant does not guarantee that a lot will be better. The various types of insects and diseases that are common to any vegetable garden can attack vegetables grown in containers. Plants should be periodically inspected for the presence of foliage-feeding and fruit-feeding insects as well as the occurrence of diseases. Protect plants from very high heat caused by light reflection from pavement. Move them to a cool spot or shade them during the hottest part of the day. Move plants to a sheltered location during severe rain, hail or windstorms, and for protection from fall frosts.